The NFL is a league that always has teams come out of nowhere to win a ton of games and surprise people. Since 1997, at least one playoff team in the NFL lost double digit games the season before. This season, the most likely candidate to pull of the rise are the Chiefs (and probably one of the NFC West teams), while the Raiders and Redskins also have shots. These surprise teams are what makes the NFL the best. Here we’ll analyze the work and ticket prices of four surprise teams so far in the first half of the 2010 season. These aren’t teams that were expected to do very well, like Pittsburgh, Baltimore, New England or Indianapolis. These are the teams that have been the surprises of the season, whether the surprise is a team finally rising from the dead, or one fulfilling the promise it showed a year ago. The teams are the 5-3 Chiefs (who’s ticket prices have been an item to watch all year long), the 5-3 Bears (who’s hot start has cooled off in an interesting way), the 5-4 Raiders (who have already matched their highest win total of any of the past 7 years) and the 6-2 Giants (who have the longest winning streak in the NFL). We’ll start with the Chiefs. The Chiefs have been the most surprising team in the NFL this season. The Chiefs won just six games over the past two seasons, and had a highly-paid QB who had been a major disappointment in 2009. In the offseason, the Chiefs became New England West, with ex-Patriots GM Scott Pioli getting the gang back together with ex-Patriots offensive coordinator Charlie Weis and ex-Patriots defensive coordinator Romeo Crennel. The Chiefs started fast with a 3-0 start heading into the bye. Now, they stand at 5-3, in sole possession of the AFC West lead, and are in great position to make the playoffs the year after losing twelve games. The Chiefs started 3-0, and since have gone just 2-3, including blowing two games in the 4th quarter, but the fans seem to have been more impressed by the 2-3 run, with three close losses on the road against good teams than the 3-0 start against three teams under .500. The Chiefs ticket price in the week leading up to their Week 3 win over the 49ers at home was $89.9. Since their 19-9 loss in Indianapolis (a game that was 9-9 entering the 4th quarter) the Chiefs ticket prices have been constantly over the $100 mark, which for that market is a lot. The price rose again after a crushing loss in Houston where the Chiefs blew a 21-7 and 31-21 lead. However, these close losses featured an improvement from Matt Cassel and the Chiefs fans really bought in. 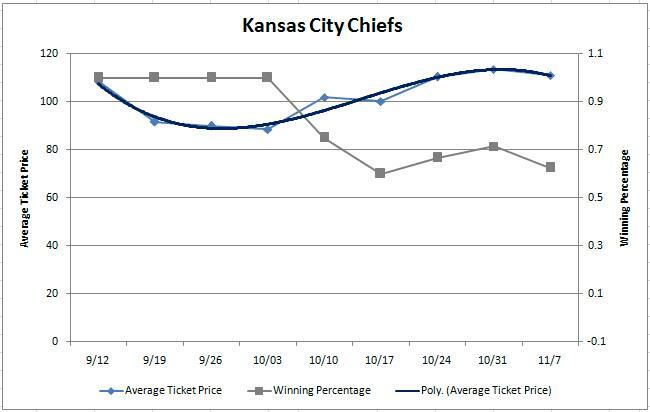 As the season goes on the Chiefs price might continue to rise as their run to the playoffs comes closer and closer. Next up are the 5-3 Bears, who are a slight surprise. Their 3-0 start was a major surprise as it included a win in Dallas and a prime-time win against the NFC darling Green Bay Packers. The Bears had some optimism entering the year with Mike Martz as the offensive coordinator and Julius Peppers along to spearhead a defensive resurgence in the city known for defensive football. It all started well, even though the team was winning “ugly”, but the Bears are now in an interesting position. Defensively, they are one of the best teams in the NFL, but two straight losses at home by a field goal made a lot of “experts” call the Bears as frauds at 5-3, but they still are a surprise at 5-3, just half a game behind the Packers, who they already beat. Yes, Bears fans are as consistent as the Bears offense is inconsistent. The 3rd game was a Monday Night affair against the Packers, which slightly inflated their price, but after starting the year with an average ticket price of $216.4 and jumped up to $250.8. 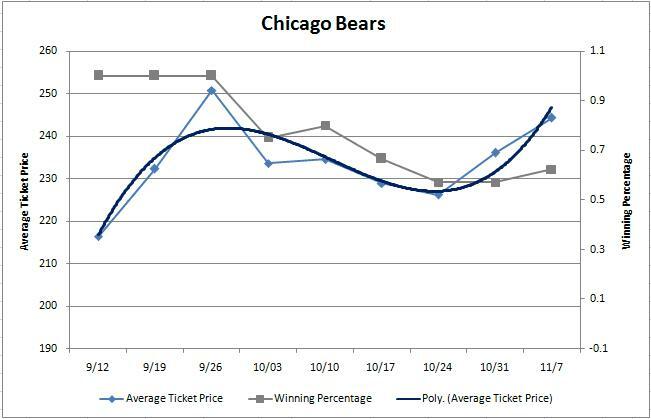 The Bears ticket price then gradually fell into the low-200s with the Bears going 1-3 in their next four games. Injuries to Jay Cutler (concussion) and the controversy surrounding coach Mike Martz and his relationship with Cutler made waves around the league, but did barely anything to hurt the Bears’ ticket prices. The Bears have been the most consistent team in the NFL. 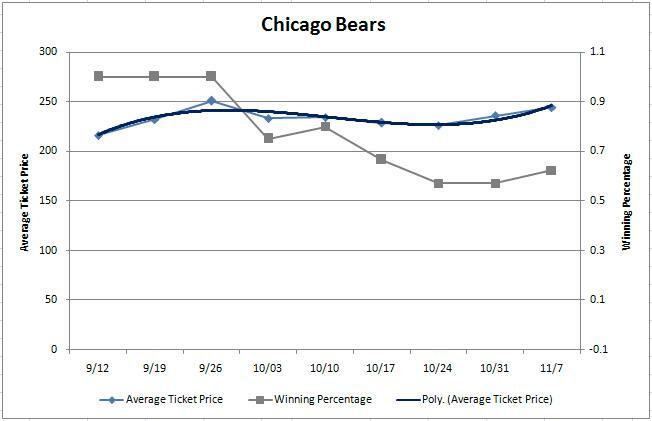 Bears losses had no real effect on the price of their tickets. Bears fans seem to believe in this team, and with that sort of defense, the Bears have won with worse (remember that Grossman character?). In the three-hole are the New York Giants, who now are, in the eyes of most, the best team in the NFC. The Giants have the longest current winning streak in the NFL, are getting after the quarterback like the did in 2007 and have one of the most balanced offenses in the NFL. The Giants were the opposite of the Panthers, as they headed into the season off a 3-8 finish to the 2009 season, including back to back losses to finish the season by a combined score of 85-16. The Giants did little too inspire confidence after losing in Weeks 2-3 by the combined score of 67-24. They were the same old Giants, so it seemed. Then, ten sacks of Jay Cutler later, the Giants are back, winning five straight games, with the leading defense and the top-running back (by yards) in the league. They won’t be a surprise any longer, but if you went back to last December and told people that the Giants team that lost their final game in the old Giants Stadium 41-9 that that same team would have a 6-2 record the following year, most would have laughed. Before they went to Indianapolis and Peyton Manning taught his little brother a lesson in a 38-14 win, the Giants were 1-0 and had an average ticket price of $226.7. 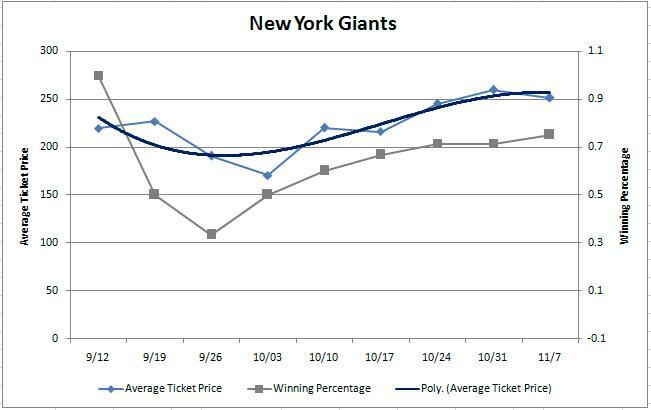 Three weeks later, the team was sitting at 1-2, and despite having an upcoming primetime game (the first in the new Meadowlands Stadium) against the then 3-0 Bears, the average ticket price was a staggeringly low $170.3 (staggeringly low for the Giants, who have rich fans and a rich tradition of high ticket prices). What is a five game winning streak worth to fans? $81.0, as the ticket price soared up to $251.3. This might be more high than what it really is, since the upcoming game is the Cowboys game (which is one of the highest priced games for the rest of the season). The Giants are high-flying right now, and so are their fans. Giants fans just have to hope this doesn’t turn into a repeat of 2008, where the team started 11-1, and ended 1-3 and went one and done in the playoffs. Cleaning up are the Oakland Raidas (as Al Davis would say). The Raiders have been a complete mess since losing Super Bowl XXXVII to Tampa Bay and their former coach Jon Gruden. Since then, the Raiders lost at least eleven games each year, which is a record for consistent losing. Still there was reason for some optimism (if going 7-9 or 8-8 can be considered optimism) heading into 2010. The Raiders seemed to finally have had a strong draft, and had some coaching stability, as Tom Cable became the first Raiders coach to make it safely through two offseasons since Jon Gruden. The draft-day trade for Jason Campbell clinched the offseason for Oakland, as they finally had some stability at QB. Of course, that didn’t end up that way, since Bruce Gradkowski was named the starter in Week 3, until he got hurt. Campbell came back in as the “backup” and led the Raiders to their first 3-game winning streak since 2002, and the Raiders are over .500 this late in a season for the first time since 2002. There is optimism in Oakland, and their should be, as they have one of the NFL’s youngest rosters, and are growing up as a real team. Which of those lines looks better? 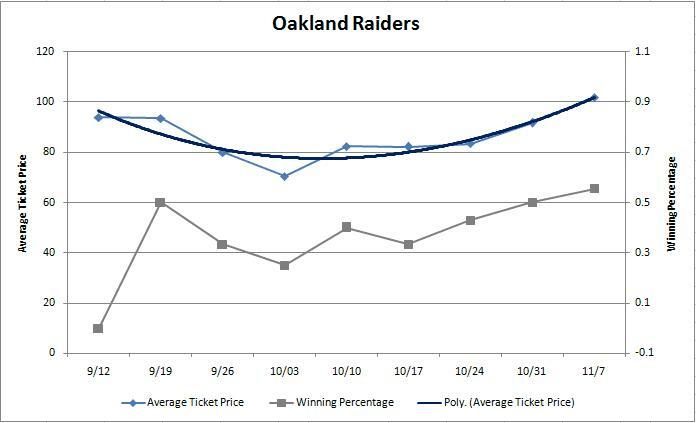 In reality, the average ticket price line is just as important for Oakland management as the winning percentage one. 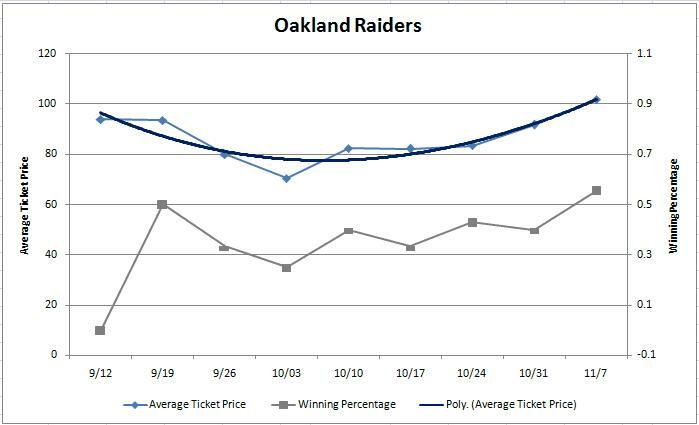 The Raiders started the season 1-2, and then their ticket price cratered in the week leading into their home loss to the Texans. The game was not sold out, and the average price was $70.5, good to put them near the bottom of the leaderboard. Since, the Raiders are 4-1, winners of three straight, and their average ticket price in the week leading upto their home showdown with the Chiefs was $101.9, and the Raiders sold out a game for the first time in two years. The Raiders are another team who might be a possibility to be relocated (again), but with the team getting better, that might not come close to happen. When the Raiders were good in the beginning of the last decade, the “Black Hole” was one of the best game-day atmospheres in the NFL. Now, the Raiders are finally coming back, and a sellout, and an average ticket price over $100 are signs of that. The Raiders being over .500 and having their games sold out: That is a surprise. The NFL season is far from over. There are always teams that are 4-4 or 5-4 at the halfway point that end up in the playoffs, like the Packers or Jets last year. We’ll see what teams make a late charge, but these four teams are ones to watch, to see if they can continue their surprising runs at the playoffs.